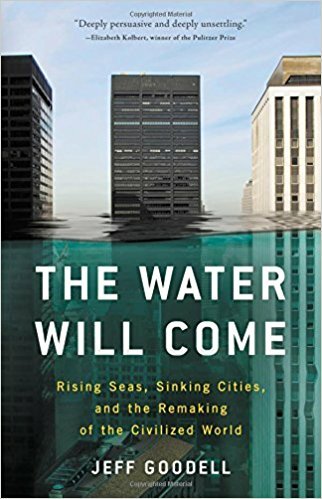 Green Team Gazette: Jeff Goodell's "The Water Will Come"
Jeff Goodell's "The Water Will Come"
Back in January I mentioned that I got a trio of eco-reads for Christmas. 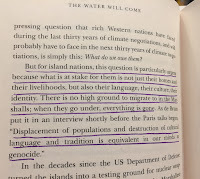 I saved Jeff Goodell's "The Water Will Come: Rising Seas, Sinking Cities, and the Remaking of the Civilized World." I think I saved it for last because the title is a tad daunting, and too close to Christmas didn't quite feel right for what I knew would be a hard-hitting book. I read the bulk of it over a three-day period. every chance I got. On the cover, Elizabeth Kolbert, author of The Sixth Extinction and Pulitzer Prize winner, is quoted as saying "Deeply persuasive and deeply unsettling." Yes, both sentiments are true. Goodell is an excellent documentarian, a riveting storyteller, and writer with a no-nonsense approach and the facts to back it. I wouldn't say it's a feel-good tale, but I would say it was an excellent read. A necessary read. A mandatory read for all. I know some climate deniers, and I still can't seem to wrap my head around that. He quoted one of my favorite Neil deGrasse Tyson quotes: "The good thing about science is that it's true whether or not you believe in it." I marked up many-a-passage while reading the book, and it does indeed haunt me. Especially in the wake of the current political climate and administration of the United States, the disappearance of climate science on the governmental websites, and the apparent allergy many politicians have with the words (and science of) "Climate Change." Goodell addresses this, as the book is quite current--having been published in November 2017. His topics are many: walled cities (by seawalls), raising cities, floating cities, canaled-cities like Venice, climate refugees, Arctic ice melting, Climate Apartheid (the separation between the wealthy and the poor), temperatures rising alongside with oceans, greater susceptibility to hurricanes and wildfires, leaving for higher and/or safer ground, pollution issues from rising water and sewage situations, the climate leading to security risks, Northern geoengineering, and more. 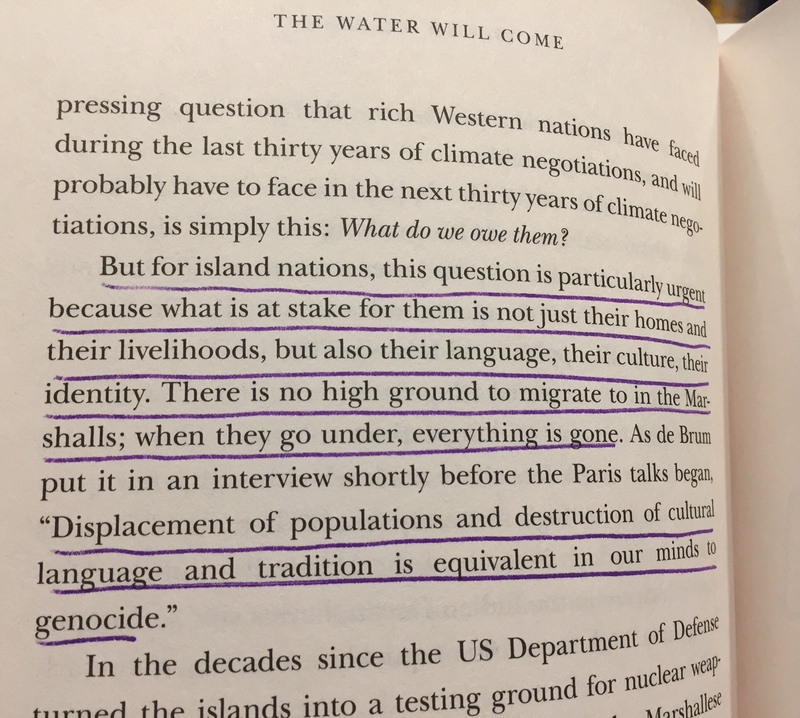 One of my biggest takeaways is that it's not a matter of "if" climate change is to happen (along with those rising seas)... but more a matter of when and how quickly. My other big takeaway is that Miami, with it's proximity to the coast and reliance on pricy real estate, may very well be screwed in the next 50-100 years. And Miami is not alone in this. I will admit: I found myself writing "yikes!" in the margins more than a few times!! Again, I say it again. Innovation is the answer to our environmental problems. We just might want to start getting a move on it to be able to manage this water crisis in a timely manner. Add this to your "What to Read Next" list. We all need to be educated. This would be a good book for everyone--especially our public officials! Book cover from https://www.amazon.com/Water-Will-Come-Remaking-Civilized/dp/031626024X/ref=asap_bc?ie=UTF8, "Book Snap" photos of my notes in Goodell's book, pages 52 and 170.